A few years ago I had a pasta day at my house, again this was in California with my three sisters and sister in law. I bought two very large bowls for the occasion and borrowed my mom's pasta rolling machine. 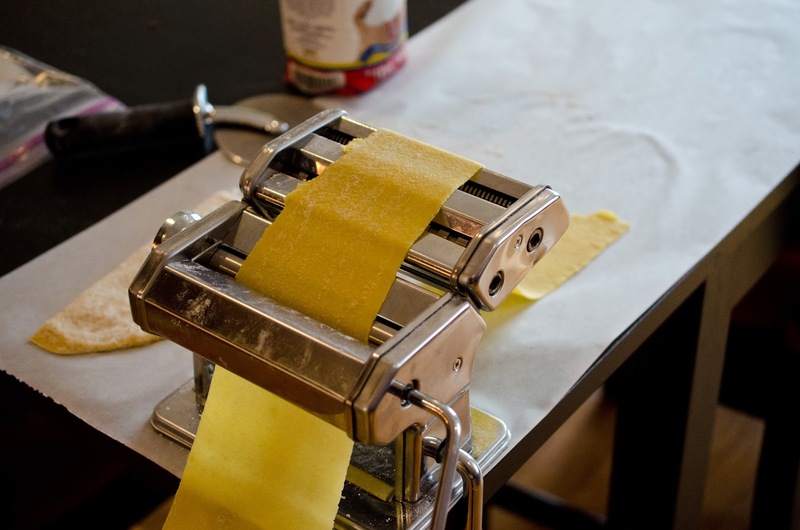 We spent hours kneading pasta dough, rolling, and finally cutting the pasta. We made it using all purpose flour, and eggs. I loved getting together with my sisters and sister in law to make food and all our children playing together. I have many fond memories with family and food. I finally got back to making pasta now that I have my own pasta machine, using different recipes and different ingredients. This recipe would be considered the way your Italian grandmother would make pasta. 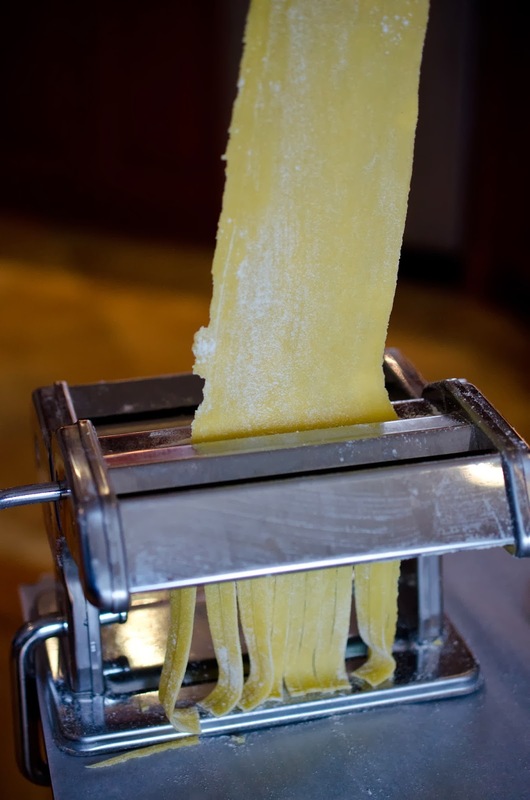 Homemade pasta is very delicious, and if you have the ingredients and tools it is fun to make. In my case I have access to the two flours that make tender delicious pasta, Semolina and 00 flours. In California I had to special order 00 flour. A little Italian foodie lesson for you. In Italy they designate flour based on grades such as 0 00, and so on. 00 flour is similar in texture and grain size to cake flour here in America. Italians use a blend of 00 flour for making those yummy thin crust pizzas found in Naples and also for pasta they combine it with Semolina. Semolina is similar to a fine grain cornmeal. 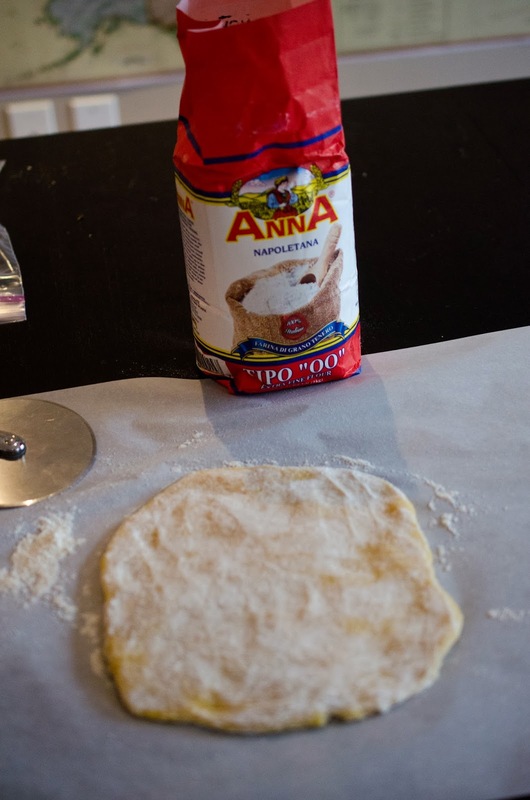 My favorite Mediterranean grocery store nearby sells 00 Tipo and Semolina, but you can use all purpose flour. This afternoon before picking up my son from preschool, I began my pasta making. Beautiful pasta, this should be on your plate. 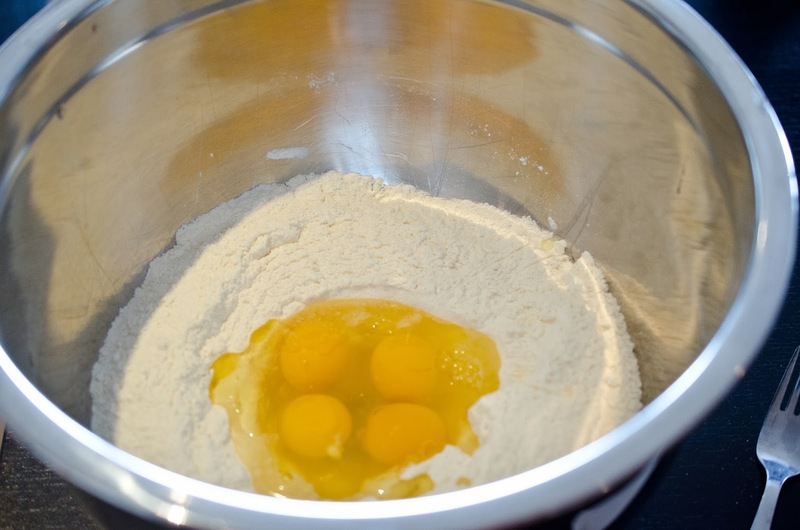 flour also works), 2 eggs, 1 tablespoon olive oil, salt to taste. I use a bowl. My Italian grandmother would be shaking her head saying it must be done on a marble top, not a bowl. I don't have an Italian grandmother, but I do have a little OCD and that reminds me, goodness I don't want that on my counter. 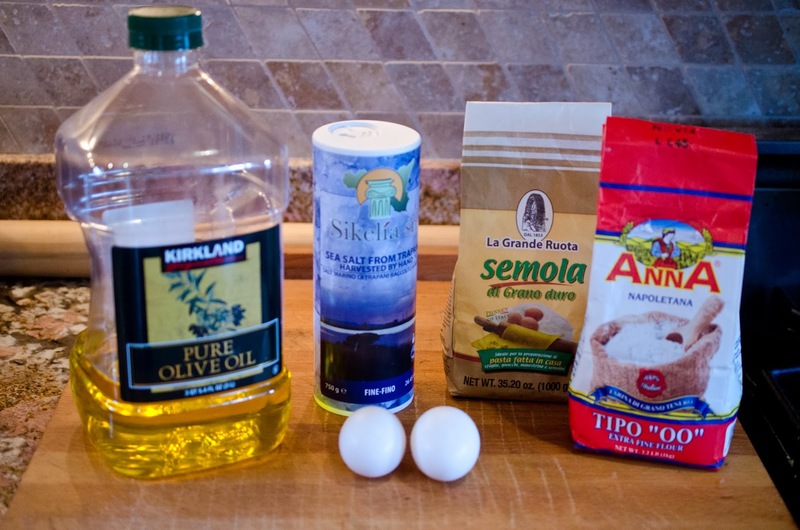 Make a well in the flour and salt mixture and crack open some eggs in the well and also the olive oil. Using a fork beat the eggs and oil together. Begin to incorporate flour a little at a time. I wore latex gloves and began to mix it by hand, then knead it for five minutes. I have more eggs than the recipe, as I'm sure everyone reading has noticed. I tripled the recipe (seven people in my family). 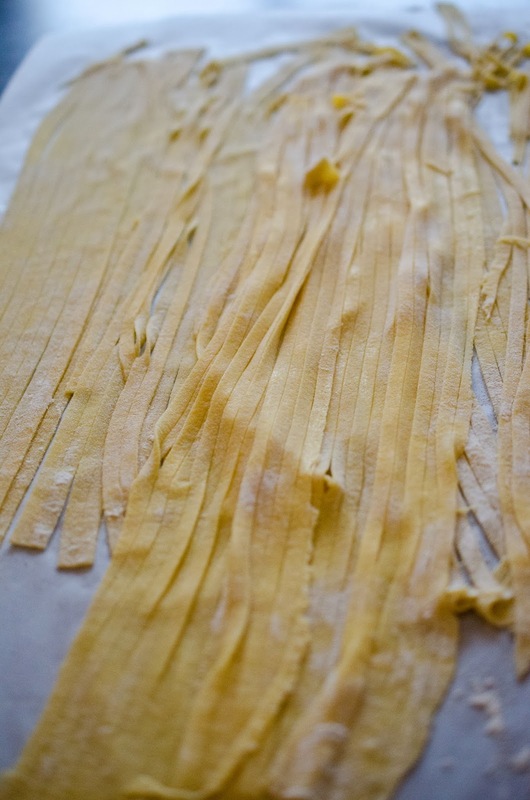 Also the recipe should yield about 18 ounces of fresh pasta. Divide dough into portions. Remember I said I made a large batch of pasta, more than the recipe so don't be alarmed. 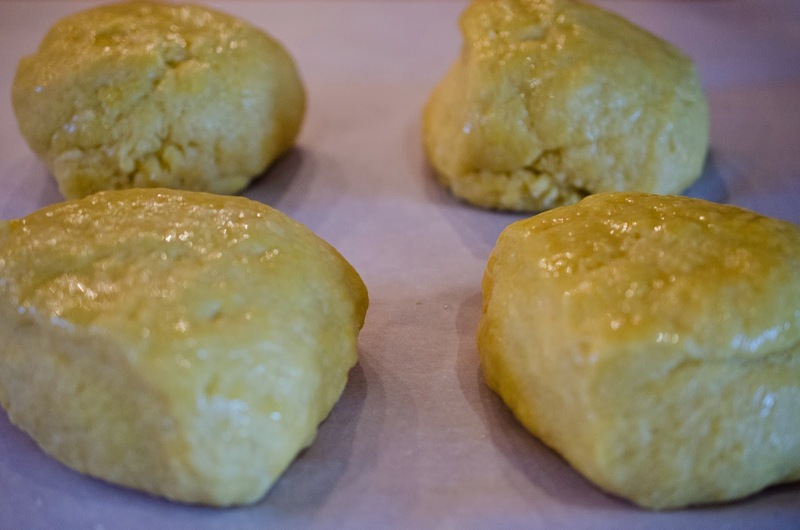 Rub dough with olive oil and place in a Ziploc bag. 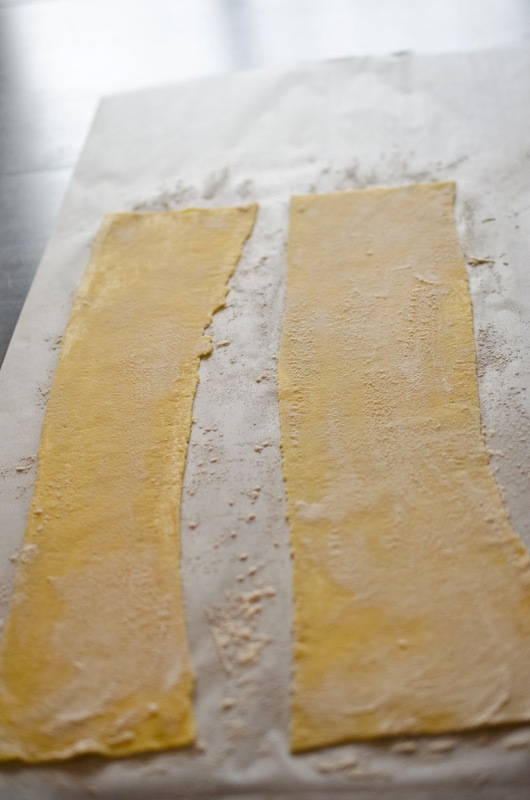 Allow dough to rest for 30 minutes, this will help loosen all that gluten you just created and create a tender pasta. through the pasta roller. The dough is very tender to the touch. settings until 3 and this is the perfect thickness in my opinion. Flour the sheets, I cut mine in half. I cut the pasta with the linguini setting. Thank you so much for sending some of these home with me the other night! They were such a delicious treat for dinner. I just put butter on for ds and the rest of us had a garlic herb sauce on top. Made some last night, they were delicious, but a little mushy. Did I need to let them dry out before boiling them? Thanks for the recipe! You can dry the pasta on the counter. 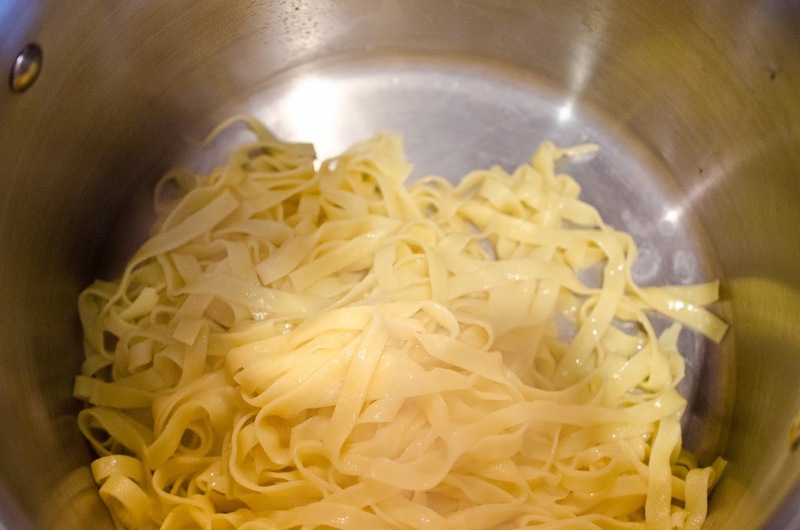 As for mushy maybe you cooked the pasta too long, fresh pasta cooks in less than a minute versus store bought dry pasta.